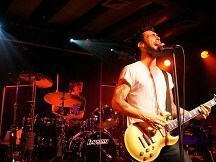 Maroon 5 want to take a new direction with their upcoming fourth album, Adam Levine has said. The group, who are set to top the Billboard Hot 100 charts with their new dance-tinged single Moves Like Jagger featuring Christina Aguilera, plan to make the most of the buzz and depart from their usual sound for their next one. "We can definitely stand to take more risks," the frontman said. "It's awesome to have that little feeling in your stomach like, 'Oh, this isn't safe, this isn't normal for us' ... (and) if you don't do that, I think you're dead as a band." Maroon 5 are now rushing to get the album done this year, while in the past, they released a record every three or four years. Their third studio album Hands All Over was released in 2010. "We're going to make it as quickly as we can (and) ride this wave of momentum," Adam said. "That's too long," he explained about past breaks between records. "We can't do that anymore. We've got to keep moving."